A mother of six is targeted by a Palestinian terrorist and stabbed to death Sunday. His father's reaction is not one of horror or shame. "I am proud of him," the father of Murad Bader Abdullah Adais told Palestinian media, reports Israel National News. Adais fatally stabbed Meir at the entrance of her house in the town of Otniel, south of Hebron, while three of six children were home. Meir's initial struggle with Adais forced him to flee the scene, perhaps saving her children from the attacker. Following an intense manhunt, Israeli authorities arrested Adais Tuesday morning. 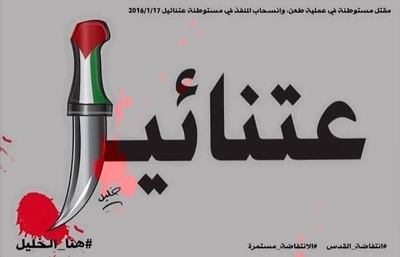 A Palestinian news website – QudsN – celebrated the murder by posting an incendiary graphic that features the town's name Otniel in Arabic, with a bloody knife forming the last letter. The Elder of Ziyon reported that dozens of comments glorified the attack, with some social media users hoping that Meir burns in hell. A day after Meir's murder, a Palestinian terrorist stabbed and injured a pregnant Israeli woman in the West Bank Jewish community of Tekoa. The Israel Defense Force (IDF) shot and wounded the terrorist, before evacuating him to a hospital. The terrorist reportedly entered Tekoa through a hole in the border fence. In the past four-month wave of Palestinian terrorist attacks, 25 Israelis and an American student have been murdered. At least 146 Palestinians, 101 of whom were assailants, have been killed following terrorist attacks or in clashes with Israeli soldiers. These people do not think the same as we do.They are full of hate and lies and enjoy murdering those who disagree with them.How many innocent people have to be murdered before stronger action is taken against them.? And who has the wisdom and the power to do so ? As things now stand, the incentives for an Arab committing murder against a Jew is both social (elevated to hero status), and financial (if killed or imprisoned parents receive a pension). The disincentives include imprisonment, razing the home of the perpetrator, loss of work permits, Clearly, in the minds of most Arabs the benefits outweigh the risks. And so, if you wish to defeat this lawless wave the disincentives must outweigh the incentives. Deportation might be one answer. If you you teach a child that his life or any other life has no value, if you teach him or her to hate the other, if you teach him or her that someone else is responsible for all their misery, if you do not teach a child to take responsibility for his own fate then you have educated a Muslim child. When will Muslims take responsibility for their own actions?